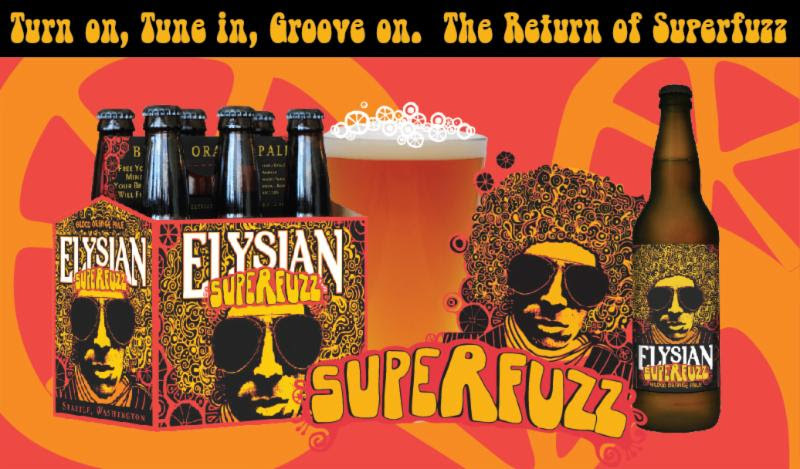 Seattle, WA – The moon is in the Seventh House, again, and Elysian Brewing‘s Superfuzz is making a comeback. This time it’s cool–even the Man digs the Fuzz–and the whole town’s up on its feet, ready for the juicy splash of blood orange and Northwest hops. Majorly delicious draft, 12-ounce six-packs and 22 oz bottles will boogie into stores, taverns and restaurants beginning April 1. Superfuzz set things right last year, and just when we needed him most. Amid a mainstream spring and summer lineup of Wheats and Whatnots, the Fuzz lit it up. California blood orange is the Main squeeze, but groovy Northwest Citra and Amarillo hops refresh to the max, keepin’ the whole thing keepin’ on. Not sweet at all, even a little bracing, with alcohol a sunshiny 5.3% by volume. Look for Superfuzz Blood Orange Pale Ale anyplace that’s copacetic. Elysian operates three brewpubs and a production brewery in Seattle, Washington. Known for variety, flexibility and creativity, they have brewed well over 300 different beers from traditional to experimental since opening their doors in 1996.